'And Eochodius son of Run king of the Britons, grandson of Kenneth by his daughter, reigned for 11 years; although others say that Ciricium (Giric) son of another reigned at this time, because he became Eochaid's foster-father and guardian. And in his second year Aed son of Niall [Aed Finliath] died. And in his ninth year, on the very day of St. Cirici (Cyrus), an eclipse of the sun occurred. Eochaid and his foster father was now expelled from the kingdom. He ruled jointly with Giric or Grig, (Gaelic - Griogair mac Dhunghail) the murderer of his uncle and Scotland's previous King, Aodh 'Swiftfoot'. Giric was probably of Pictish descent. Very little is actually known about either of them. It is thought that Eochaid was a minor for whom Giric may have acted in a capacity as Protector or Regent. Bernica was over-run by the Picts and the monastery of Lindisfarne plundered. Giric annexed the Cumbrian district South of the Solway to the Kingdom of Strathclyde. He also liberated the Picts of Galloway from the dominance of the Angles. 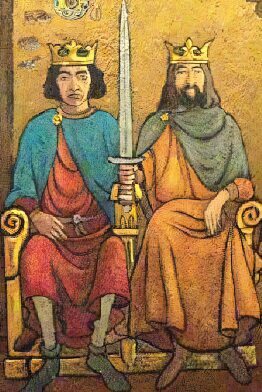 Eochaid and Giric tried to strengthen their position by conciliating the Scottish Church, which they freed from the various exactions and services to which it had been until then liable to. Which was correctly seen at the time as a bid for popularity. And Eochaid, son of Run, the king of the Britons (of Strathclyde, and) grandson of Kenneth by his daughter reigned for eleven years; although other say that Giric, the son of another, reigned at this time, because he became Eochaid's foster-father and guardian. They were succeeded by Eochaid's cousin Donald II. Click for Tanist Genealogy.